Tixel uses controlled heat energy delivered through a specially designed handpiece to encourage the skin the to renew itself. It does this by the controlled removal of tiny pin sized portions of the surface of the skin, which activates healing and the formation of new skin cells. This freshens the appearance of the skin, stimulating collagen which helps to combat signs of aging such as fine lines and wrinkles as well as being a good treatment option for acne scarring. 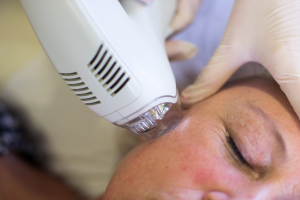 “Open-Channel” treatment: This treatment opens the pores on the skin allowing penetration of topical treatments. This can be used in treatment of skin pigmentation problems such as age spots or pigmentation. Non-Ablative treatment: This is the least aggressive treatment, so is the best option for clients who want minimal downtime. Ablative treatment: This is the most intensive treatment, which can give effective results on skin rejuvenation and scar treatment. Results are comparable with CO2 laser resurfacing treatment with a minimum of 2 to 3 days downtime. What is Tixel used to treat? What’s the downtime for Tixel? The downtime for a Tixel treatment depends on the application. The more gentle treatments requiring minimal downtime of 1-2 days, and the more aggressive treatments requiring longer downtime of around 1 week. Normal activities can be resumed after treatment, and it’s encouraged that clients use high factor sunscreen (50 SPF) following treatment. The number of treatments depends on the individual needs, on average we’d recommend 3-6 treatments 6 to 8 weeks apart for the most effective results. After a full course of Tixel treatment, results can be long-lasting as long as all aftercare instructions are followed.